Juice all ingredients and enjoy. Use the celery to push the spinach through the juicer. This is a favorite of mine. There is a juice shop I frequent that has this organic juice on the menu and it makes a nice mid day or afternoon pick me up. I added green grapes and cut the recipe in half. Great taste and refreshing. Just started juicing this tastes excellent,really recommend you try it. I love green juice! It's so refreshing and delicious, and you just feel the goodness infusing into you the moment you drink it. Mmmmm. This green juice is a great natural medicine for the people who are suffering from sugar and cholesterol. My doctor recommends the same for me as the blood sugar level in my body is at border. New to juicing and wondering about my combinations. Hugh’s reply **************Wow Ray, sounds like you’re doing well. 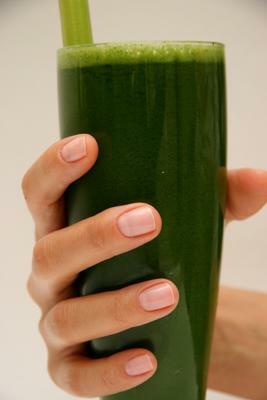 Its great that you like the green juices, they're the best. I love spinach and use it fairly often, but I would recommend mixing up your greens a little. Just rotate in other greens like bok choy, cilantro, parsley, romaine lettuce, collards or kale. Lemons might be a good addition on occasion as they actually help with the uptake of nutrients from greens. Green bell peppers are actually unripe, which is why so many people have digestive issues with them. Red or orange peppers would be great. You’ll probably find lots of ideas here on the raw-foods-diet-center.com website. Many more healthy years to you Ray!